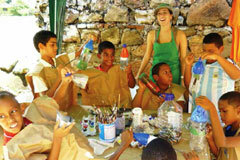 Gabriela Batista, also known as “GaBa”, started the Zero Pollution Alliance with her artistic work on “The Right Bag” and “The Right Bag workshops” to spread knowledge regarding the negative impacts of plastic bags on the environment and to educate children of all ages about these impacts. With the support from the Alliance’s co-founder, Jorge, also known as “Gio”, GaBa organized and delivered 40 workshops for approximately 600 children and 400 adults, with more than 12 private companies and NGO´s supporting the initiative. By 2014, the programme had handed out more than 16,000 reuseable bags at events including workshops, film presentations, as well as at fundraising galas. GaBa also worked with several local artists and entertainers as well as NGOs to produce a TV video clip and community program called “Úsalas para todo…hasta para salvar el Planeta” (roughly translated as “use them for everything ... even to save the planet”), which promotes the use of re-useable bags. The impact of these activities was promising but it needed more support from government and private organizations with a real interest in changing the attitude towards plastic bags. As Gaba admits, “Some large retailers in Panama are carrying on with this initiative. However, the world waits for younger generations who will remember their experience in painting reusable bags with their favorite themes and recall at the cashier line the importance of their participation for change and the use reusable bags. While the number of reusable bags is still low, it is a strong start”. Aside from its work to promote re-useable bags, the Zero Pollution Alliance started in 2009 to promote the segregation and proper disposal of mercury contaminated products, mercury compounds and waste consisting of elemental mercury. The first program on the Zero Mercury Mission was “Ponte Las pilas con las Pilas” or “Put Batteries with Batteries”, to promote the separation of spent batteries from common waste for proper collection and final disposal. The program started at the United Nations School in La Chorrera City, Panama, in July 2009 with more than 60 children, 20 teachers and volunteers in attendance. At this time Gaba and Gio hosted a workshop to foster awareness of the importance of waste segregation with respect to spent batteries at home, in schools and at businesses. The composition of the batteries and their potential impacts on health and the environment was also explained. The workshop participants worked on a simple solution to remove the negative impacts on the environment of improper disposal of spent batteries: re-useable plastic bottles were decorated for use at home, school and work to remind people to collect spent batteries to help protect the environment. The Alliance hosted such workshops all over Panama, reaching approximately 4,500 people. By 2014, more than 23 tons of spent batteries, coming from schools, homes, hospitals, universities, and private companies, and UNEP’s headquarters in Ciudad del Saber, had been collected and disposed of in an environmental sound manner.